There are some immediate debit card fraud management steps that you must take if you discover that one of your accounts has been hit with fraudulent transactions. The key to successful recovery is a timely and complete response. Many will argue that debit card laws protect cardholders just as credit card do, however, minimizing risks associated with debit card fraud such as the number of fraudulent transactions and fraud amounts will protect debit cardholders against the unavailability of cash in the account until a dispute is submitted and investigated which credits the money back in the account but not before hours and days of being without the stolen cash out of the accounts. Before we discuss the debit card fraud management steps, we have to be in a position to detect the fraudulent transactions as they hit the accounts. For this, we must activate the available alerts in the account. Most online accounts allow account holders to set a notification for specific transactions or amounts. For example, you may want to know the debit transactions that hit the account more than you may want to know about credit transactions. It’s nice to know about credit amounts that enter our accounts but knowing about the debit transactions is a sure way to detect fraud. Other security alerts and notifications may be set up for debit card used in phone or online transactions, wire transfers, and checks cleared. The key to an effective debit card fraud detection to set up the available alerts and appropriately follow up when such notifications are received. When you first set up the security alerts, make sure that you test the feature with real and live transactions. 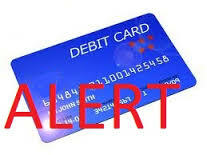 For example, when you use the debit card for a transaction, look for the alert to come in. Notice how long after you made the transaction, you receive the alerts. Some systems are faster than others. Then each time you receive a transaction notification, follow up to make sure you recognize the transaction. One of the first things that you need to do after you detect a fraudulent transaction is to quickly assess what has happened. Was the transaction made online or did someone access your account directly which means that someone knows your account pass code. Or, was a debit card used to make the transaction in person. If so, do you still have the debit card or was it lost or stolen? If you still have the card and the transaction shows a debit card transaction in a restaurant, chances are that fraudsters have stolen your debit card information and have created a counterfeit card. Usually, cardholders are not responsible for fraudulent card transactions whether the cards were lost, stolen, or used in counterfeit operations. But, cardholders must notify the banks or card issuer promptly. Someone accessing your account directly with your access code is a completely different case as banks may put the blame on you for either lying, sharing the code with someone else, or, being careless in protecting the password. Cancel the debit card – Some accounts offer an online feature that cardholders can use to cancel a debit card and request a replacement. If the feature doesn’t exist, call the company and ask them to close the card. And if no-one picks up the phone, consider changing your debit card issuer when you have the chance. In debit card identity theft cases, fraudsters want to maximize their profits by charging the card as much as possible knowing that smart cardholders will block the card very quickly. This is why when the first fraudulent transaction hits the account, it becomes a race between the fraudsters and cardholders. They want to maximize their profits while cardholders want to minimize their losses. Dispute the charges – Although cardholders have plenty of time to dispute the fraudulent transactions that hit their accounts such as 30 days from the statement date in which they appear, unfortunately, banks don’t allow cardholders to dispute transactions until the transactions move from “pending” to “complete” status. This is a not a big risk to the cardholders but potentially a risk to the banks. Move cash out of the account – it is a wise thing to move all available cash to another bank if you have one or another account in the same bank. This way even if the card cancellation does not become effective immediately, future debit card transactions will be denied as there is no money in the account. When choosing a debit card, consider the account alert features which help you detect fraud quickly. Consider the availability and speed of the features. Also consider how quickly the bank picks up the phone when you call and what level of service you receive upon your first call. These are important considerations when selecting a new debit card or deciding which one to keep. These debit card fraud management steps also apply to credit cards however debit cards pose a somewhat greater risk to cardholders than credit cards. Educate yourself and get certified to become an identity theft expert.